Instead of making a few words special and interactive, instead of making the author have to decide on all the useful navigation options, why not make all the links interactive? He calls this HyperWords™; the hypertext research literature has been calling these "generic" or "contextual" links, or more generally "intensive" links, since the late 1980's. Generic links establish a connection from any occurrence of a string -- perhaps qualified by its context -- to one or more destinations. For example, any word might be linked to a search engine and an encyclopedia entry, while anything that resembles a name might be linked to a telephone directory. Complex rules have been explored -- for example, references to "Jobs" and "Gates" might be treated one way in the domain "wired.com" and in another way entirely in "householdTasks.org". Storyspace gets a lot of mileage from generic links -- particularly from its unique combination of generic and point-to-point links called guard fields. Joyce's classic afternoon, a story is constructed entirely from highly specific and carefully-crafted generic links: you can click on any word in afternoon and the hypertext will respond. You're not linking to words, you're linking to character sequences that represent words -- often ambiguously. The string "Washington" might be a city, a state, George, Booker T. , the Nats, or the Redskins. Authors don't offer navigation options to be "useful"; thoughtful writers use links to express ideas. Argumentation seeks understanding, not merely access. There's some connection between HyperWords™ and a research program at University College London on "Liquid Information". This project, confusingly, seems to have nothing at all to do with Polle Zellweger's well-known work on liquid hypertext. In the very early days of hypertext research, people worried a lot about hand-crafted links. "How will we ever afford to put in all those links?" We also worried about how we'd ever manage to afford to digitize stuff for the Web, not to mention paying people to create original Web pages. Overnight, we discovered that we'd got the sign wrong: people would pay for the privilege of making Web sites. The problem isn't the 'tyranny' of the links, and replacing it with the tyranny of the link server might not be a great solution. Thanks to Robert Black, Xavier, J.Nathan Matias, Hinnerk Haardt, Dave Phillips, and others for suggestions! Here's a small compendium of weblogs with book notes. I compiled this from my correspondence and some unsystematic mining of Technorati. Technorati's usefulness for the task is almost completely destroyed by right-wing blogrolling. Many high-ranked blogs tagged for 'books' have little or nothing to do with books, but espouse positions on religion, abortion, or Iraq that attract blogroll links from other extremists. The problem lies in with Technorati's naive trust in blogrolls, which are easily gamed, rather than in any fundamental wingnut propensity amongst bloggers. Matthew Josefewicz suggested some even better ideas for what I've been called "intimate publishing" -- Web sites and blogs intended primarily for your immediate circle. The Greek term for your household -- including servants, employees, retainers, clients, and such -- was oikogenia. So, an intimate weblog would be ecogenic. Google reveals that a 1975 paper unsuccessfully tried to launch ecogenic energy as a synonym for renewable energy, and it's an occasional misspelling for the medical term echogenic. Nobitic is clean. Nobigraphic is a google whack. Memo to files: two things went right in the kitchen last night. I tried the fennel broth again, using half a sweet onion, a small fennel bulb that was past its prime, 4C water, some fennel seeds, an allspice berry, 4 cloves of garlic, and 3/4t each sugar and salt. This time, I served it plain, in small servings, maybe 6oz a person. It looked nice in the bowl, and it was pleasant to eat. I rubbed some duck breasts with sugar and salt and a little coriander and juniper, and left them in the refrigerator for a few hours. Then, I put them in the smoker over a little bit of hickory and a the contents of an teabag, and smoked them for 15 minutes before finishing them on the grill. The smoking step added a lot of taste, and it was much easier than usual to get them cooked through without completely charring the edges. We also had some cute baby brussels sprouts, seared in a the fat from a strip or two of bacon, braised in balsamic vinegar and veal stock, and sprinkled with the bacon, and a few grapes roasted with olive oil and salt. The brussels sprouts worked nicely, the grapes need further study and, probably, a hotter oven. Ailsa Parker has a new BlogHui abstract on the use of RSS in libraries. RSS is primarily a method for spreading the word about changes, sharing new developments among people who want to be notified. This seems at cross purposes to the needs of libraries, since libraries collect and preserve. Libraries want, above all, a stable literature; RSS wants to tell you the news and then vanish. But librarians need news as much as anyone else -- particularly news about the world of writing. What books do we need to know about? What books do our patrons need to know about? RSS is a superb channel -- provided you can create a good reading list. That's another reason sharing your book list helps everyone. Your close friends may be interested in what you're reading, but people you've never met might find it useful too. British mystery writer John Baker has a nice reverse-chronological list of his current reading (scroll down the right-hand column to find it). A little George V. Higgins, a bit of Auden, a touch of Lillian Hellman, a dash of Northrop Frye. This is gold for librarians -- or for booksellers who want to go beyond reinforcing the best-sellers. Update: Jennifer Elrod (Squirrel Tao) notes that booklists can help liberate librarians from best seller lists. Booksellers have very different needs than libraries -- they have to sell whatever drives people to bookstores this week, and that's often driven by national and international forces. Libraries buy for the long haul, where bookstore buyers need to buy for next week. Bookstores can return what doesn't sell; when a librarian uses a chunk of budget, it's gone forever. More Updates: Library Stuff urges librarians to talk more about RSS and its role. Juan Cole reports that the shrine of Salman the Persian was destroyed yesterday, after guerillas killed the guards, placed explosives, and detonated them. Google News has reports that guerillas fired two rockets at the tomb, which was not much harmed. Most of these reports seem to be derived from a press conference. The shrine is 20 miles southeast of Baghdad. You'd think that someone could check to see if the shrine is still there, or not. Can the US forces not manage to project power 20 miles outside the Green Zone? I'd like a screenshot of the Kaycee Nicole's weblog. Better yet, I'd like to have access to some of the pages. If anyone knows of an archive, a mirror, a private whack, or can put me in touch with Ms. Swenson, I'd be grateful. Email me. Subquery: what's a reasonable approach to 'whacking' or spidering a site, to create a good archive of a page set while not clobbering the server? There used to be special software for this, back in the days of slow modems. How do people do this today? I'll start something in the computer hypertext, and then Ill discover something really exciting that may have influenced the artist... So I go to a book or the Internet and research that and then, invariably, I find something else that takes me in an entirely different direction. I just don't feel I can know enough or find out enough anymore. It just doesn't stop! It's changed everything! The formal Innovate paper is also online. (registration required). Put simply, students began to think about their thinking as a result of their hypertextual experiences. 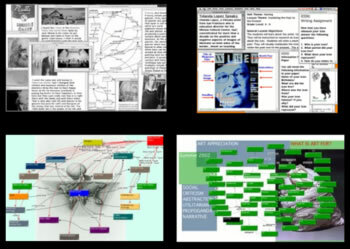 As they saw the connections between history, ideas, art, and popular culture, they created electronic links; as they created links, their thinking became more complex and critically reflective so that they could explain the significance of those links. The more they worked on their computer hypertexts, however, the messier those hypertexts became. Opening a student file and finding a computer screen filled with a dizzying array of lines and arrows amidst many boxes often disoriented readers (Exhibit 9). However, as Caine and Caine state, 'We are meant to learn from naturally complex and 'messy' experiences' (1997, 11). Aucklander Rachel Cunliffe (cr8d design) has an interesting speculation on novel weblog page layouts. Tinderbox fans will find familiar echoes. It feels a little like Anja Rau's old Flickwerk side-scroller, but she's planning to use horizontal space for a topic dimension where Rau used horizontal scrolling to move back in time. Of course when a six year old dies there is a lifetime of unfinished business. There is the promise of the person she would become but something I love about Kim is that she and I never lost sight of the person she is. For some research I'm doing on what I'm currently calling intimate publishing, I'm taking another look at weblogs (and similar things) that have book or film lists like mine (see the left-hand column of the main page) or, for that matter, radically unlike mine. Web 2.0 apps can play too. This lyrical, intelligent, and interminable thriller is a fascinating puzzle. Writing in the Believer, Tom Bissell lauds it to the skies, and it's not difficult to see why: few writerscan so quickly and vividly sketch impressions of every aspect of the Carribean. The places and people of Shacochis's imaginary island are instantly recognizable -- the airport workers, the ferry snack-bar that never opens, the beach bar where tourists and local businessmen mix, the immigrants from up North who work in offices and schools and who occasionally walk down to that bar for the music or to cut one of the pretty tourist tuna out of the herd for a night to remember. This guy can tell you things about rum punch that you didn't know you'd forgotten. But people come, people go, stuff happens, and this thriller never quite gets moving. That the protagonist doesn't understand what's happening to him is only to be expected, but we never quite learn, either. Long, leisurely excursions provide plenty of backstory without casting much light on what's happening to the people who brought us to the party. At times, this feels like a brilliant collection of interlinked short stories that was forced to dress up as a novel. In any event, such elliptical plotting simultaneously demands and repels attention. Nonetheless, required reading for visitors from up north and the best thing I've read about the modern Carribean. A heart surgeon and former lieutenant colonel who ran for Congress in 2004 has been placed on the no-fly list -- presumably because he opposes the Republican policy on Iraq. Have you noticed how sugar is making its way back into the rotation of spices? Last night, we had a big, thick salmon steak. I rubbed it with some Indonesian curry, and then jacked the rub with some cinnamon, some kosher salt, and a sprinkling of sugar. 30 minutes in the refrigerator, and then 40 minutes in the stovetop smoker (oak chips). It turned out very nicely -- brown and a little crusty outside, nicely cooked meat. We had it with salt-crust potatoes and a little bit of fennel broth (a leftover fennel top, some about-to-be-discarded celery leftovers, a shallot, 4c of water, 1t fennel seeds and an allspice berry). Reduce to about 1.5c, filter. One of these stories is not like the other. Circuses. I ate a cheese sandwich. is not really boring if you do it well. And there are lots of ways to do it well: so many, indeed, that I left out some important ones. How I made a cheese sandwich is always interesting. While I was in LA, Linda did some experimenting and found that lightly toasting the bread before grilling the cheese sandwich made a huge difference -- the bread stayed crisp, it got nicely buttered, and the Vermont cheddar melted just enough. The cheese sandwich may focus a larger issue or resentment. Every Tuesday and Thursday, they serve the same cheese sandwich to the inmates -- a repulsive and unhealthy sandwich which, thanks to graft and profiteering, costs the taxpayers more than steak. This is the dominant discourse of political weblogs. The sandwich isn't merely an emblem, but it's part of the picture. The cheese sandwich may be introduced for pacing. I am in the midst of a dramatic, unfolding story -- struggling with a dreadful disease, perhaps, or running for Congress, or selling my startup to Google -- and you're visiting my weblog every day to see what happened, and today I'm going to tell you a long and interesting story about this cheese sandwich because I want to remind you that life continues to unfold while we're waiting for the test results or due diligence. It's not just cheese sandwiches, of course. Compose blog posts that use this story for each cheese sandwich variant. Tuesday nights, Linda is sitting in on a theater course at Harvard and so we eat even later than usual. Last night, I cut up a duck to use later in the week and used the trimmings and legs to make duck sausage. I really need to do something about the state of my knife. This was easy. I tossed the meat into the food processor, chopped it a bit, and took about half the chopped meat out. I tore up a couple of slices of bread, let them soak up 2T of skim milk, added them to the processor and chopped some more. I mixed everything up with 1T of Penzey's russian sausage spices, made patties, put them in the smoker with some hickory and smoked them for 40 minutes. We had the duck sausage with some remoulade I threw together from a leftover hunk of celery root, and I pan-roasted some broccoli that was getting old in the refrigerator. The whole duck costs about a dollar more than what the Museum charges for the duck breasts alone. Bottom line: it's a pretty nice, fast dinner for something made from scraps and leftovers. A year ago, Jason Kottke asked his readers for contributions, so he could spend the year blogging. He hoped for, and got, about 1/3 of his former salary -- enough income, in short, to get by. In the anniversary post, "Oh, what a year", he thanks everyone and explains (obliquely) why he's not asking for contributions again this year. An interesting new Flint weblog: Working In Movement. Flint is Tinderbox's new weblog assistant. It creates varied styles of weblogs, but the real point is to use Flint as a starting point for tuning your own weblog exactly as you wish. Some paper abstracts are starting to appear on the BlogHui blog, part of the ramp-up to next month's weblog extravaganza in Wellington, New Zealand. Today's additions are an interesting small-scale ethnographic study of weblog writers and readers, and a look at the place of a national library in harvesting and conserving weblogs. New pages in Notes About Notes include and introduction to incremental formalization and a note about the widespread anxiety people experience that writing things down will put them on their permanent record. As usual, these notes come with some delightful pictures of notebooks, this time from Nathanael Archer and from Sonja Engdahl. The original question dealt with people dropping by your office at the university, but let's look at the bigger (and more common) scenario of conferences and trade shows. Profgrrrl is right that "I'm incredibly busy" is boring -- and so it's the most useful response to have ready when you're unprepared for the question. "I'm excited about _____, which is turning out well." is better. I can almost never manage this backstage, because I'm usually worrying about what's going wrong instead of basking in what went right. When you're on stage, though, basking in what went right is better. It's on-target for your messaging and also more interesting, because you already know what turned out well and you don't know whether the stuff you're worrying about will turn out well or ill.
"I just found/read/discovered ______, which might interest you!" This is much better. You're sharing research, giving away something that might be valuable and also indicating what you're working on. It's always possible that they won't be very interested, but that's OK; it's the thought that counts, and they might come back with some data that will really interest you. Both Jill and Profgrrrrl are wrong, IMHO, about dressing to blend in. At conferences, you don't want to blend in: you want people to notice you and to remember you next year. It's best to be famous in the field, but if you aren't, being "that very tall guy from Harvard" or "the young woman from Oxford who had bright green hair and some preliminary data on Kayenta polychrome" is better than being forgotten. Last night, we went to the Craigie Street Bistrot (happy anniversary to us) for the late Sunday night chef's whim, in which Tony Maws cooks whatever seems right for the moment. It turned out to be six terrific courses. A wonderful soup (did she say sourdough?). Curry-poached dayboat scallops. A terrine of quatre foies with pickled Vidalias. An incredible little plate of pork jowls with black truffle and a puree of carrot. Wild boar. Panna cotta with passion fruit and candied fennel. Over the years, I've had great luck in restaurants where there was no particular choice. Sometimes it's custom, like the little restaurant near the Campo di Fiori where they don't have menus, just whatever they cooked today, Sometimes it's language: after sufficient incomprehension, the best you can sometimes hope for is to say, "you are the expert, please tell us what you think we should eat and drink." Sometimes it's the plan, like the tasting menu at Peck or the back room in Florence where you could have a fancy dinner at half price of whatever they happened to have in surplus from the main room that night. If I really knew exactly what I wanted to eat, I'd probably sit down and make it -- when I really want something very specific, it's usually something simple, a nice grilled steak or a crisply sauteed trout or entirely too much ice cream. It's great to leave the decisions to an expert, to go back before they invented restaurants (which was later than you'd think) to the days when, if you were eating out, you went somewhere and had whatever the host was having. Tinderbox turned out to be invaluable to me for the D*I*Y Planner v3 project. It helped me gather and collate many hundreds of community suggestions, note my progress and ideas, coordinate the volunteers, set up a bug tracking system, and even write the release notes, press release, template descriptions and more, all in one handy little Tinderbox file that I keep on a thumb drive. Christy Dena explores spatial hypertext with respect to constrained writing -- things like the Oulipo game of writing stories without the letter 'e'. People who want to disparage weblogs like to say that they're full of dull trivia. "I ate a cheese sandwich." Let's take a look at the craft of the weblog, by looking at the craft of that cheese sandwich. How can the cheese sandwich matter? How can it be interesting? First, it might be an excellent cheese sandwich. I had a very fine bleu cheese the other night at AOC, a mild and creamy bleu from a small farmhouse cheese maker in Minnesota, served with a nicely fresh and crusty baguette. Food blogging has been immensely successful and influential. We're in the midst of a food writing revolution, a new way of thinking about food, and blogs and other forums are leading the way. Second, eating a cheese sandwich might be a notable accomplishment. After a long convalescence from surgery, I actually ate a cheese sandwich. Or, the cheese sandwich might affirm or reject a longstanding habit or prejudice: though you all know that on moral grounds I have always despised all meat and dairy products, yesterday -- defying my physician, my ancestors, and sneering at hell's bells -- I ate a cheese sandwich. The cheese sandwich may be the conventional occasion for an extraordinary event. Yesterday, I was eating my usual cheese sandwich and Roger Ebert came into the sandwich shop and sat across from me and we had a long talk about Pauline Kael. The cheese sandwich may be a symbol or emblem, standing concretely for an abstraction. This need not be a grand or remote literary effect; indeed, much food writing is not precisely about food at all, but rather uses the food and our feelings about it to approach even deeper subjects in ways that, if addressed directly, might seem merely sentimental. The cheese sandwich might identify a place and time, situating a story specifically in order to help us believe. The Sunday bagel and cream cheese in the Bronx, or the elaborately-garnished, thin slices of seven-grain organic bread and imported low-fat Havarti wolfed down at a desk in Hollywood, can matter beyond the bread and cheese. This book, a diner's primer on the restaurant business, has some very fine writing. My father never managed to get a sandwich named after him at the Stage Deli, and he never won the Nobel Prize. Years after his death, however, a Greek diner on Columbus Avenue still offers 'The Professor Salad', and you can still order 'Professor's Special Lobster Cantonese' at a local Chinese restaurant. And I like to think that, somewhere out there, the Russian grill man is teaching physics at a prestigious university but still remembers how to make 'Eggs Professor'. What's missing from this most pleasant and entertaining of books -- I saw it in Vrooman's Pasadena and it seduced me away from a very fine thriller -- is anger. Ruhlman, in The Making Of A Chef, is angry at his instructors, angry at the archaic tradition, angry at the snow. Bourdain, in Kitchen Confidential, is pretty much angry at everything since the Enlightenment. Shaw finds himself in tall cotton -- he's writing about good food, he's eating it and talking about it and he's getting an advance against royalties. Through much of the book, everything is wonderful. We need a dash of acid -- vinegar? citrus? Perhaps need bad guys and bad meals, if only for balance and exercise. Want to send a telegram, mister? You can't. Western Union discontinued telegram service on January 26. Talk about end of an era. My recommendation: try to arrange your life such that you never find yourself running calculations on your way to the emergency room, trying to figure out whether you're going to get to keep your husband or your house. For a while there, I was scared I was going to lose both. I've met Mike Bonifer a couple of times at Digital Storytelling, and so while I was in LA I thought I'd call and say hello and find out what his new venture, Network LIVE, is really doing. Bonifer blogs the delightful meeting he set up with him and some of the Network LIVE crew. You get the feeling Bernstein could get just as engaged in a discussion of crayon choices with a kindergartner as he is discussing form factors for hypertext publishing. As you can see, it was a wide-ranging meeting. Owning context, ad hoc media networks, knowledge representation for entertainment industry creatives, tagging and inheritance, the impact of spam farms, and Tinderbox. For starters. I think I might start using similar sorts of euphemisms here, now and then. Call it the Justin Hall effect. Justin was the first artistically-successful memoir blogger -- he was blogging years before anyone coined the term or wrote the software -- and he's still writing . Recently, he's written movingly about the impact that writing a famous memoir can have one your life: you meet people at parties and they don't know whether to ask for your autograph or run for the hills before they wind up in your weblog. I don't want to meet people and worry that they will flee in terror because they don't want to wind up on this page. And sometimes I might eat a cheese sandwich with people you know too, or whose work you know, but I want to write about the cheese sandwich and not about the famous person who happened to be there. I'm not being coy, and it's not some sort of in-joke that other cool kids know. It's just craft. Is that OK with everyone? Oppressed by a foul mood, a foul schedule, and an oppressive pile of reading I ought to have been doing in its place, I picked up this volume again a few months back. I'd read it years before, in its natural order, but I'm all out of O'Brian now and so the only option is rereading. And this one is lots of fun, as Capt. Aubrey is sent to Australia in the ship that will long be remembered as "the horrible old Leopard", carrying orders to sort out the mess at Botany Bay and -- much to Aubrey's distaste -- to drop off a few prisoners. And then, having spent a few days reading this fine but unnecessary novel, I left myself a note in my Projects Tinderbox file to mention it here. And there that note has sat, since last September, until today. Leaving to Linda the fun of coping with a 18" (50cm) of snow, I had to spend an extra day here in the sun, picking up some loose ends in LA. First, I went to the old Farmer's Market at 3rd and Fairfax, where I had a plate of very respectable huevos rancheros morita and bought a big jar of French mustard and a small bottle of Italian vinegar. Then, I went to the Norton Simon museum. Absolutely astonishing: in a year in which it seems everyone is doing a Degas show, their permanent exhibit is absolutely overstuffed with wonderful Degas. Plus amazing Corot -- some early work I adore, a ton of very good Henry Moore, and plenty of Maillol. 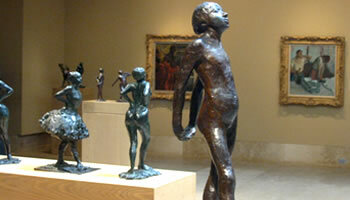 And, I'm a big Maillol fan: it takes a heap of Maillol to be enough. And then, just because The Writer said I should try it and could probably eat at the bar, I stopped by AOC for a fine plate of rillettes (with a very good Gigondas) followed by a wonderful little square plate of coq a vin. The best chicken I've had since Da Ilia in Milano about a decade ago (goodness -- she has a web site now! ), the best braised chicken ever, with lovely little bits of bacon and a delicately perfect sauce. My first impression of the immaculate little leg and thigh, centered on a circle of potato so neat I thought perhaps it was a tortilla that had wandered in from the next cuisine and gotten lost, was that this coq a vin was altogether too genteel. But it was simply very, very well done. And if I can find any of the Arcadian Jill's Cuvee 2000 Pinot Noir in Boston, that was terrific, too. There are two trucks parked outside the hotel from a company that provides a mobile espresso bar for film, television, and commercial shooting. Next time someone tells you that computer games are bigger than the movies, think about this. How many people make a living from catering to game designers? More on hypertext and movies: Years ago, when hypertext was still mostly a lab curiousity and the Web was still far in the future, most people thought that hypertext was inherently disorienting. My first papers were full of this, arguing for bookmarks and compasses and breadcrumbs. Now -- weirdly for me -- the navigation problem has been turned on its head; Glass Shallot (Adam Baer, please put your name on your About Page) unpacks the confluence of hypertext and Syriana further, arguing that structural complexity is meant to unsettle the old and complacent reader who is not native to the net. This is, after all, the easiest way to incite anxiety in a viewer like me who had the Internet at age 17 and often has to flood my mind with linear methods of storytelling just to remain a clear writer. This is, delightfully, my old heretical argument that hypertext is not disorientienting turned on its head and spun like a top. But there's a catch: doesn't Nashville (1975) work the same way? The Getty is, indeed, an impressive museum. A fine collection, extravagantly housed and beautifully mounted. The wall signs are written for visitors without much attention span. Do we really need to pump up Bouguereau as a controversial painter? The claim, as far as I understand it, is that he's controversial in the way all beaux-artes painters became controversial: his opponents converted him. And then there's the photograph caption that mixes up enormousness and enormity. But there are still the paintings, like this wonderful Sweerts portrait from 1654, which still looks fresh and photographic and I've seen this woman in Belgium. Odds are, this is just a blunder, but an "affective visual style" is not inconceivable and might be a clever and funny shorthand for what Ebert says in his review. This is probably just an editorial enormity but it might be a clever coup. It's hard to know. It's about to snow a little in Boston. The airline has decided the smart thing is to avoid sending planes to Boston that might get stuck in the snow. So, it looks like I'm here in LA for an extra day. Ideas? Dinner at Cuidad, which was terrific. Especially the goat cheese fritters, which were served with a wonderful touch of honey-lavender sauce. And gooseberries! And the swiss chard empanada, with a tomatillo sauce rich in cilantro. Since I use my Mac almost exclusively now, my favourite programs are Curio and Tinderbox. Both programs are elegantly simple and a pleasure to use. Jason Kottke has an interesting metareview of Syriana, examining Roger Ebert's speculation that Syriana is a "hyperlink movie". I'm staying in downtown LA. While I've visited Los Angeles a lot, I don't think I've ever been downtown. I remember aunt Joan telling my parents that she never went downtown anymore. I believe I was about four years old at the time. The world is getting flatter. I got a decent price on the hotel (Priceline), but I'm paying more to park the car than I'm paying to rent it. This is California, not Manhattan: you're supposed to have a car, right? First report on the new stovetop smoker. Last night wasn't a good time for anything elaborate: Linda's photography seminar was slated to run 'til eight -- maybe later -- and I had to be up at five the next morning, heading for Los Angeles to explore some new Tinderbox ideas. But new equipment has its own imperatives, and so I put a few alder chips in the smoker and loaded it with a piece of west-coast salmon filet (dusted with brown sugar, salt and pepper) and an unadorned portabello mushroom. The salmon was very good -- smoky, tasty, pleasant. The mushroom, which went into the smoker unadorned, needed plenty of salt but turned out really well. I'm tweaking the weblog layouts while flying to LA. Let me know what breaks. Speaking of arm-twisting, Heidi's new stovetop smoker at 101 Cookbooks led me to get one of those smokers, too. Heidi's a vegetarian, which puts a crimp in the smoker's style (though she doesn't seem to feel it -- smoked mushrooms? garlic? tofu?? ). I'm looking forward to trying some salmon, maybe trout. Brisket? Last weekend featured another stock day -- this time, a mixture of duck and veal bones. And there was a leg of lamb, roasted atop a sort of potato-onion gratin for a thymey peasant casserole, which really didn't turn out quite as well as it sounded. There are reports of a big new study that suggests low fat diets really aren't notably better for people. I'm getting closer and closer to Julia Child's attitude: they really don't know, so the best you can aim for is to eat a lot of variety and even out the strain. Writing in The Believer, Nick Hornby likes What Good Are The Arts? by John Carey so much that I had to get a copy, even though (as a glance at the Books Purchased list at left will demonstrate) the last thing I need right now is a book. His calm, wry logic ... enables him to demolish the arguments of just about everyone who has ever talked tosh about objective aesthetic principles. And this group, it turns out, includes anyone who has ever talked about objective aesthetic principles.... Carey's approach to the whole sorry mess is the only one that makes any sense. I'm looking for a word. Some bloggers want a big audience. Some affect not to care how big their audience is, but you know that in their secret heart they'd like to have a lot of readers. Some want the audience for its own sake, some want the advertising dollars or political power that audience can bring. But some blogs sincerely don't care about the audience. Some are written for colleagues who happen to share an interest in 13th century Chinese poetry or Mucha Habermann Disease, the origins of the kachina cult or new methods for teaching group theory. There are important topics, but they're interesting to specialists. Other weblogs are written primarily for Mom. It's always nice to write Mom. Perhaps the audience is a little bit broader, but lots of weblogs are meant for your inner circle, your intimates, your 1-chon. Some blogs are meant primarily for your staff. They replace memos and meetings. They communicate schedules and intentions and management desires. They aren't meant to get outside. What shall we call these small weblogs -- weblogs where the writer is personally acquainted with most or all of the readers? Clarification: I'm not seriously proposing bloglet, which is bad on several counts. I do think we need a word. 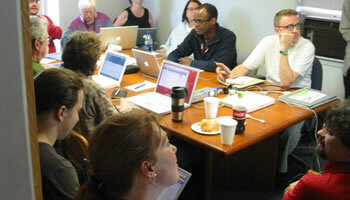 Registration for BlogHui (Wellington, New Zealand, 17-18 March 2006) is now open. I understand that space is quite limited, so you might want to sign up early. Presentation Zen is an interesting weblog on presentation techniques, by Gary Reynolds. Focused topics make great blogs, but they work even better with a Fagerjordian link style. After all, the point of calling it "presentation zen" is, I presume, that this is timeless advice. Organizing it chronologically -- by reverse sequence of publication -- seems inadequate. An observation: everyone seems to agree that they sit through too many bad presentations, but there's not much consensus on the remedy -- or on what a good presentation might be. Madden describes a mundane, domestic moment in a straightforward, 6-pane comic, and then proceeds to recast the same scene 98 different ways. We see the scene from his point of view, from hers, from the point of view of the refrigerator. We see it from above, and below. We see it from next door. We see it from the perspective of the critic, or of the notional actor who is performing the scene. We see it in the style of Jack Kirby, Scott McCloud, Hergé, and the Bayeux Tapestry. A highly recommended addition to the new media reading list. Do other people have problems reaching blogspot weblogs? I often have trouble getting Atrios, and assumed that was simply a popularity issue: zillions of people all trying to hit the server at once. But tonight I tried to get to a new site Lisa Firke had redesigned, and the server times out in midstream. Adrian Miles says he's been too busy to blog, but does mention an interesting (and sold-out!) conference on Digital Storytelling coming up in Melbourne. It's interesting how orthodox digital storytelling has gained specific pockets of uptake. Berkeley, Melbourne, Wales. What do these places have in common? It would be interesting to free digital storytelling from what one Blogtalk Downunder speaker called its relentless optimism -- an attitude that stems from the need to have a story (or it would not be storytelling) that is authentic and true (or it would not be 'personal' as the digital storytellers understand it) and that can be told in a 210-second script (imposed by the need to be able to finish the digital story in the course of a workshop). My guess is that all three factors are ripe for attack; see also the growth of podcasting and its variants. This superb textbook surveys our current archaeological understanding of the Puebloan Southwest, from origins through contact. Kantner deals masterfully with controversies and heresies, showing the student where the professional disagreements lie without allowing the text to be consumed with them. Kantner deals judiciously and well with modern techniques and trends, particularly the use of genetics, forensics, social modeling, and studies of ancient environmental degradation. Kantner resists the tyranny of the ethnographic present, yet uses available evidence from ethnography and the historical record judiciously and well. More followup on January's eNarrative 6, from J. Nathan Matias. I just dropped another 2G into my desktop computer. It took about ten minutes and $150. I still think this amount of memory is astonishing, extravagant, strange: I remember when a 64K board was a monster. It's easy to be try to get by without enough memory, or disk, or speed; Eastgate used to have a terrible time getting barely adequate hardware. And, these days, you don't hit a brick wall that says, "You can't do your work until you get more RAM." Instead, everything just slows down a little, or works a little less reliably. Backup. Get a big enough screen. Get enough memory. Have plenty of disk. Have a good notebook, and a good pen, beside your computer. You'll get more done. From Peter Watts, a wonderful PowerPoint presentation on Vampire Domestication: Taming Yesterday's Nightmares for a Better Tomorrow. Homo sapiens whedonum! Thanks, Kathryn Cramer. 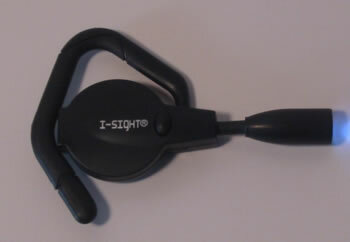 Eastgate has got a new, improved personal task light, the I-Sight. The new model lets you replace the batteries when they wear out -- the old one replaced the LED and batteries together. More important, the new model has a focused LED, so more light goes where you want it. You deserve to have a luxury wrist accessory! Why would wearing a t-shirt to the state of the union address get you arrested? My post about Stonewall Kitchens jam, the price of software, and the juvenile attitudes you see so often in comment boards, struck a nerve -- and got a lot of traffic. Personal software is radically underpriced. People get a LOT more value from the software than they pay for it. You can start a graphic design studio without taking a university design degree; you probably can't without Photoshop. One university course, or one tech conference, costs a lot more than Photoshop. Tools like Tinderbox that help you hold on to your ideas cost a few hundred dollars, the ideas you don't lose should be worth thousands. If you're in control and making decisions that matter, the value of saving a few hours here and there is huge. Writing a blog costs thousands of dollars a year, and is wildly profitable at that price; software that lets you write twice as many posts -- or makes those posts a little bit better -- is worth thousands. Support costs for tire-kickers and kids are important. Low price points encourage impulse buyers, yes. They also encourage buyers who will turn around and deluge you with phone calls and email looking for help getting their circa-1997 Web browser configured. For years, we all knew that people should have better monitors, but that people wouldn't pay for better displays. That log jam broke, suddenly, when Apple shipped the original $3000 cinema display and made it an Object Of Lust. I think we're about to see the same thing in productivity software -- a real range of capabilities and services, offered at diverse prices.